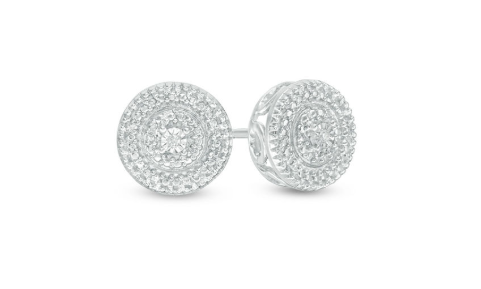 Act quick to purchase a pair of Diamond Accent Stud Earrings in Sterling Silver for only $24.99 (regular $119). That's a savings of over $90! Details: You'll adore the petite touch of shimmer these dainty fashion studs add to your attire. Crafted in sterling silver, each earring features a diamond accent artfully set to enhance size and sparkle. Concentric circles of beading around the centerpiece catch and reflect light for a dazzling look. Polished to a bright shine, these post earrings secure comfortably with friction backs. Act quick! Offer expires May 24, 2018. Use code ZAFFDIASTUDS at checkout to receive this special price offer. I never pay a lot of money for jewelry. These are a great deal and very elegant too. These are stunning. I always get my jewelry from Zales. Those are really pretty and that was a great deal! Those would make a nice gift.